As the daughter of two Croatian immigrants, I spent almost every summer growing up in Croatia. I didn't plan to go this summer but as July approached, I found myself suffering in the incredible humidity of New York City. I emptied my piggy bank (literally), divided my summer wardrobe with my twin sister, bought a one way ticket to Split and took off. For those of you who aren't familiar with Croatia, I’ll begin at the beginning. Croatia is located across the Adriatic Sea from northeastern Italy. It's best known for its natural beauty, crystal clear waters, and over 1,000 islands. The Gothic and Baroque architecture has become famous recently through the HBO series Game of Thrones, which films King’s Landing almost entirely in the UNESCO world heritage town of Dubrovnik. By the way, Diocletian was the only emperor to actually retire (without being killed or sacked) so he could enjoy both palace and farm cabbages. History, geography and tradition impact Croatian cooking. You will find influences from Italy, Austro-Hungaria and Turkey. 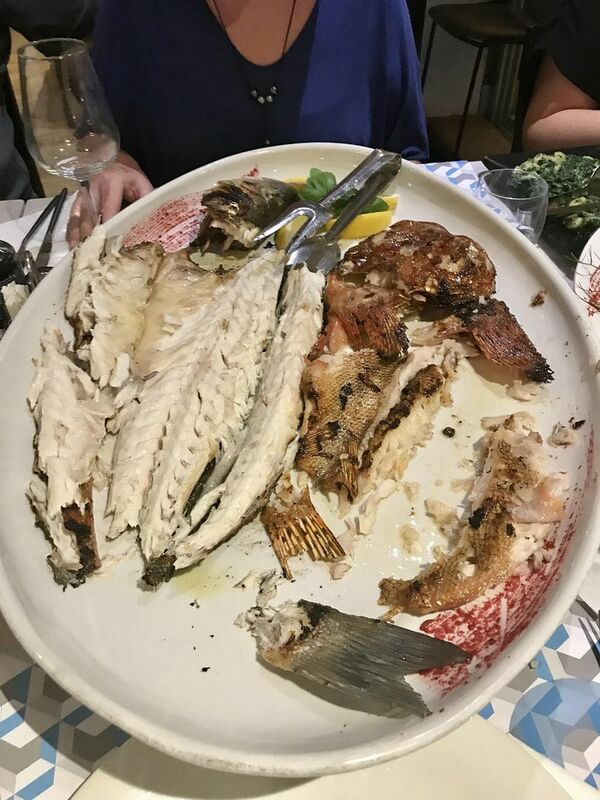 “Dalmatian” cuisine, found on the coast and islands, uses fresh, Mediterranean ingredients that are simply prepared, but still manage to surprise. 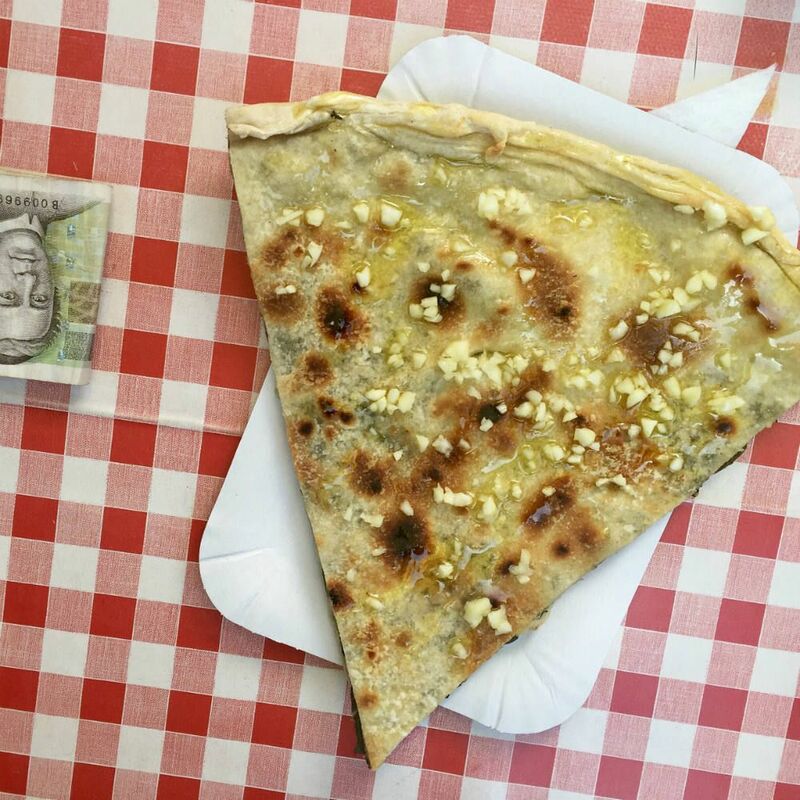 I spent the past month in Dalmatia, and these were my top eats. A “konoba” is a rustic, traditional restaurant that offers regional specialities prepared in old ways. What to order: Pašticada sa njokima (beef with gnocchi) (not pictured but I had it on my second visit) is a beef and gnocchi dish with a sweet and sour type of sauce made of olive oil, garlic, rosemary, bay leaves, thyme, parsley, prunes, dry fruit, vinegar, Prošek (dessert wine) and pancetta. 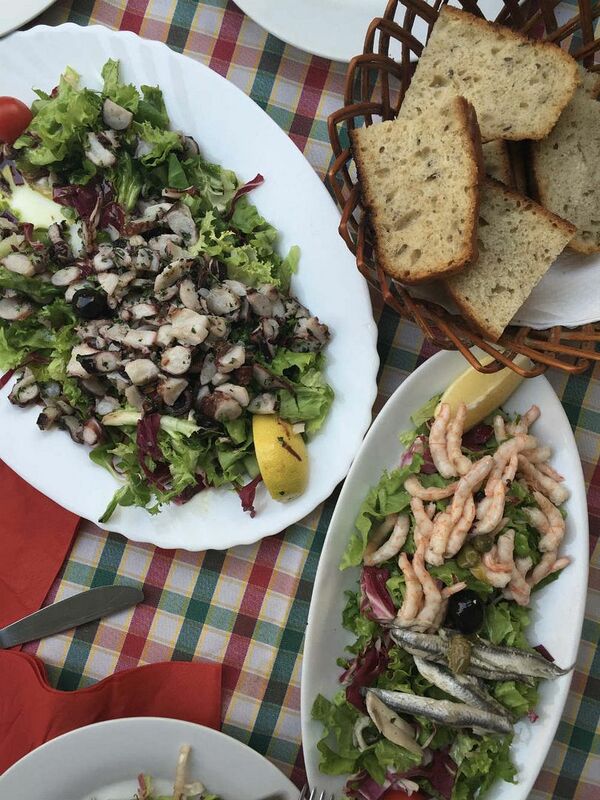 Hobotnica (octopus salad) with onions, tomatoes, parsley, olive oil and lemon. 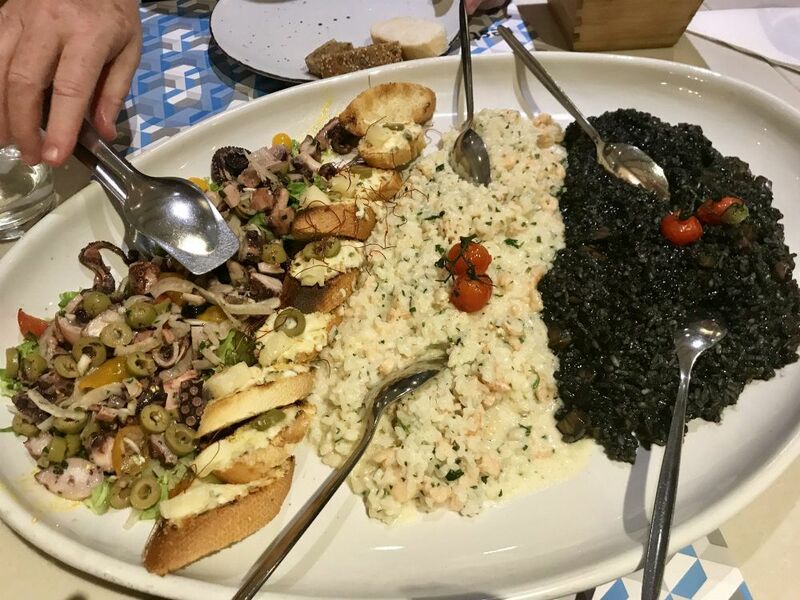 Note: You'll see octopus salad and cuttlefish risotto often in this report, but each restaurant has a different dish. Amaze yourself with the many variations. Look for Šoparnik (savory Swiss chard pie) with raw garlic and olive oil. Vis was a WW2 military base that was closed to the public until 1990 and still maintains a mysterious air. What to order: Rižot od sipe (cuttlefish risotto) not the typical black color but a dark red with generous pieces of cuttlefish and an appealing rich spice. 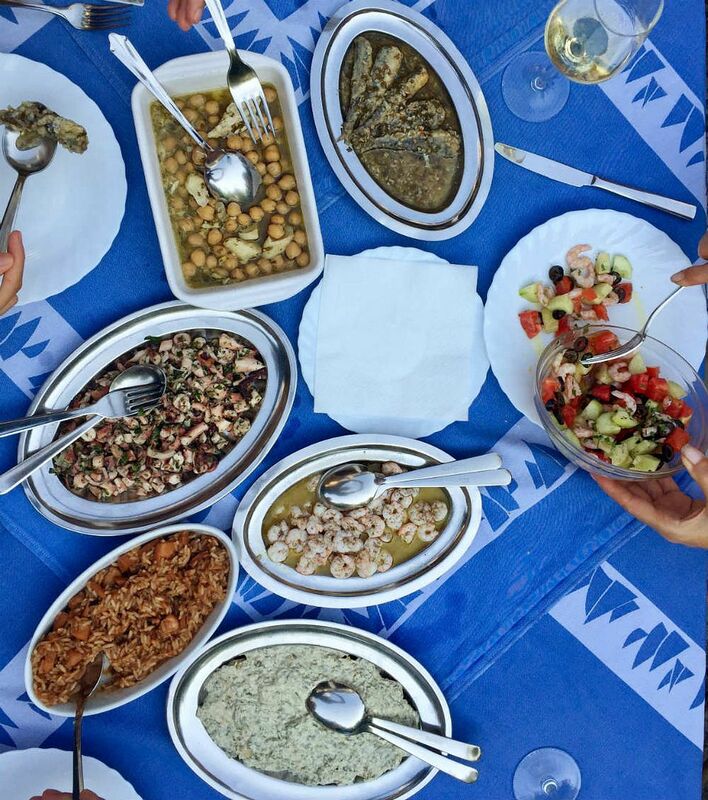 Riba sa slanutak (fish cooked in chickpeas) chunks of white fish with fresh chickpeas, olive oil and salt. Ljetna salata sa kozicama (fresh summer shrimp salad) is a baby shrimp salad with cucumber, tomatoes, olives and onions. Tuna u umaku sa caparima (tune in caper sauce) is tuna in a cream sauce with local wild capers, olive oil, and tiny egg white slivers. Goran’s boat tour ended up being the highlight of my summer! 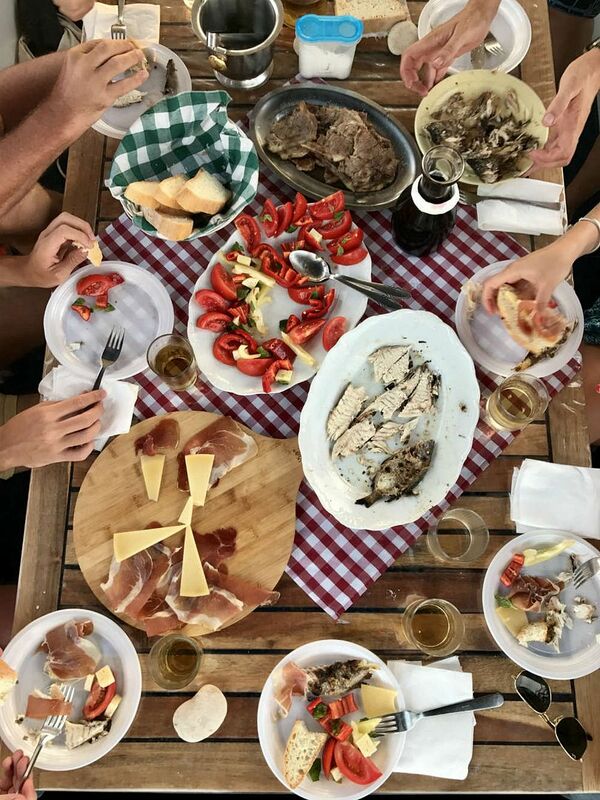 It was a private excursion to nearby islands, an amazing dinner of fresh fish (he caught and grilled the fish right in front of us), pork chops, a tomato salad, homemade wine, local cheese and prosciutto. Hamburger od hobotnice (octopus hamburger) a octopus patty with lettuce, tomatoes and onions in a bun. Don't forget to order a Karlovacko (Croatian beer)! Hobotnica Salata (octopus salad) with lettuce, tri colored tomatoes, fennel, olives, olive oil and vinegar. Blitva (Swiss chard) sautéed Swiss chard with potatoes and olive oil. Bruschetta sa jastogom (bruschetta with lobster) topped with cheese. Bijeli Rižot (white risotto) with fish, shrimp and cream. Enjoy your meal! Or as the Croatians say, Dobar Tek! 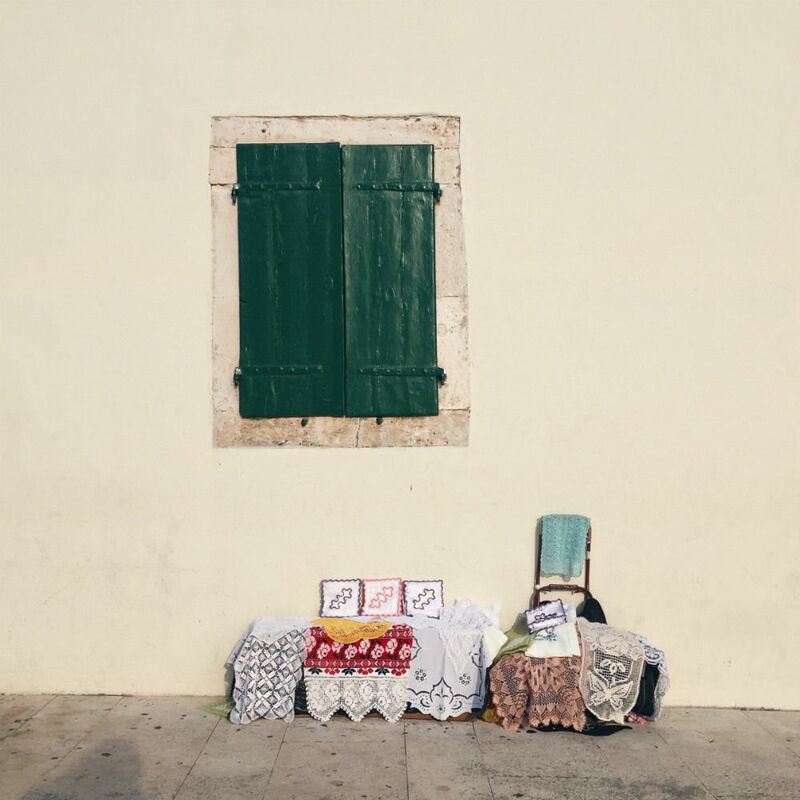 Handsewn tablecloths in Hvar, Croatia.